The Lighthouse product team kicked off a redesign for our patient touchpoints, starting with the most critical one for dental practices: appointment confirmations. As a result, we increased appointment confirmations for our dental practice clients, and created a modern email template we could use for other email campaigns. That 90's-looking email was just the tip of the iceberg. This is just one example of our appointment confirmation emails. Appointment confirmation campaigns had multiple variations, based on how many days were left until the patientʼs appointment. For example, if the patient made an appointment more than 30 days from today, she would be placed in the “Long-Term Reminder” campaign. Confused? Overwhelmed? I definitely was, so I mapped out the different emails (as well as text messages and automated phone calls) that were part of the appointment confirmation campaigns to better understand the objectives behind each one. Through this process I uncovered a convoluted strategy, and was able to understand why the emails werenʼt meeting their objectives. There were too many elements begging for the usersʼ attention, diluting the main call-to-action: “Please confirm your upcoming appointment.” Adding a little more complexity to the mix was our clientsʼ ability to customize certain elements of the emailʼs design, often diluting the main objective of the emails further. 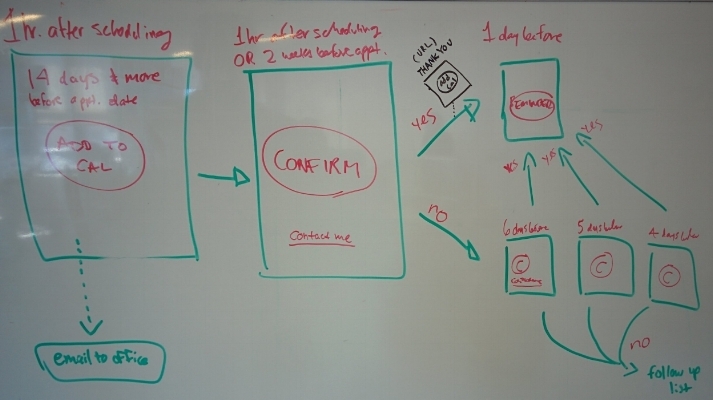 Once our team could agree on these objectives, I proposed a simplified process for all the appointment confirmation campaigns, condensing the messages into two timelines that would be underpinned by a streamlined email template. These were developed in close collaboration with our product manager, copywriter, engineering manager and software engineers to make sure our messaging was spot-on, and to double down on technical feasibility. As a next step, I worked closely with the visual designer on our team to figure out how we would manage the customizations that many of our clients had implemented in the previous templates. Along with our product manager, we agreed to limit the amount of customization that would be possible with the new templates, and cleared this with our Customer Support team to ensure they could manage expectations and escalate issues when necessary. Moving forward, we would use the clientʼs logo as a baseline for the colors we would use in the email designs, and limit customizations to text modifications, excluding the call-to-action and appointment date which would be sourced from the system. The last step in this process was to test our new designs. A successful test meant we would apply this template to our other automated campaigns: review solicitation, recall notices, treatment plans, and reactivation. We hypothesized that with the new email design for appointment confirmation emails, we would see an increase in the number of appointments that patients confirmed via these emails. We planned to implement the new template with a small group of about 20 beta clients, and make any necessary updates given the results of that beta test. We saw a marked increase in appointment confirmations with the beta group, so weʼve now rolled out the new template to the rest of our clients which number over 10,000. The main issue we ran up against had to do with the client logos at the top of the email. We received complaints from a small number of clients that their logos were too small or appeared distorted. Given our template, it was understandable this would happen since we were restricting the height of the logo, so we could ensure the call-to-action was immediately visible when the email was open, regardless of device. Since it was a smaller-scale problem, we decided to address it with the help of our Customer Support team. They worked with our clients to update their logos, rather than us changing the design which was successful for a large majority of our clients. Ultimately, our test proved our hypothesis and given the success of the new email template, weʼre not working to implement it across all our automated campaigns (with slight variations, to accomodate for different objectives in each campaign). Of course, none of this would be possible without the collaboration of our cross-functional teams, and the extension of that to our Customer Support team as well.